Dr. Schaefer earned his bachelor degree in biology with a minor in chemistry from Indiana State University. He graduated from Purdue University School of Veterinary Medicine in 2018. 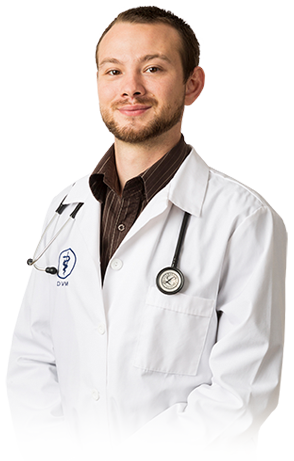 He started working at Hobart Animal Clinic immediately after earning his Doctorate of Veterinary Medicine. He enjoys all aspects of veterinary medicine with his most significant interests being soft tissue surgery, dermatology, and preventative medicine. He is also Fear-Free certified and enjoys behavioral management. In his free time, Dr. Schaefer enjoys outdoor activities with his cattle dog Rocky Raccoon such as camping, canoeing, kayaking, hiking, and fishing. He also enjoys watching movies as well as training his dog to do tricks and run amateur agility courses. He loves helping pets and their people and saving lives.